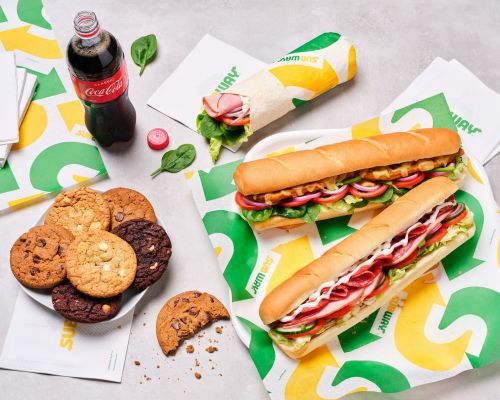 Menulog delivers for Subway - Barton so you'll be able to track your courier on a map. Want a convenient and delicious breaky? We have you covered with a poached egg and your choice of cheese! Yum! They say breakfast is the most important meal of the day! This breaky sub is made with premium shortcut bacon, a poached egg and your choice of cheese. Try it with spinach, onion and capsicum, top it off with BBQ sauce and this sub is sure to get your day started off the right way. This is the go to breaky staple! Try our famous ham with poached egg and cheese today. The perfect start to your day! Jam packed with your choice of crisp salads. This sub will be sure to make you feel good and get the most out of your day. Try adding some avocado for an extra protein kick! Hot out of the toaster oven, it is the Pizza Sub with Cheese. Enjoy pepperoni and salami layered with tasty melted cheese and our signature marinara sauce. Try it on freshly baked Italian herb and cheese bread today. The meatball sub is our signature sub and one of our customer's favourites. Juicy meatballs smothered in rich marinara sauce, topped with your favourite cheese and freshly baked bread, this sub will tantalises the taste buds and have you coming back for more. Delicious tuna chunks mixed with creamy mayonnaise. Choose your salads and add your choice of bread. Its combination made in heaven. Vegetarian or not, you will love our veggie patty sub. The perfect meatless option. Add avocado for an extra protein hit. The Subway® signature Italian B.M.T®. Layered with pepperoni, salami and ham and topped with delicious cheese, this combination of mouthwatering ingredients will melt in your mouth. Smashed falafel topped with tzatziki dressing and select salads. The ever popular Chicken Classic is a true taste sensation and only available at Subway® Restaurants. Try it once and we guarantee you’ll be hooked. Let this lightly crumbed Chicken Schnitzel bring some lunch or dinner deliciousness to your table. This sub is made from 100% chicken breast and loaded with flavour! Dig in to this sub for a big hearty meal. Marinated spicy buffalo chicken breast strips with tangy blue cheese dressing. This flavour will have you coming back for more. The mini sub is perfect for our younger Subway® lovers. Kids can build their sub the way they like it, by choosing their bread and fillings, including a wide variety of salad options – to keep them going all day. Comes with a mini Mt Franklin Water and a SPC Puree & Simple. Who said salads had to be boring! Turn your favourite sub into a salad today for a lighter option than your usual sub. Load it up with all the crisp salads, top it with tasty sauce. Our salads will have you coming back for more.